To access this material, please read the Rules of Use, indicate your agreement, and provide the password. President Kennedy confers with new US ambassador to South Vietnam, Henry Cabot Lodge, just before Lodge leaves to assume his post. 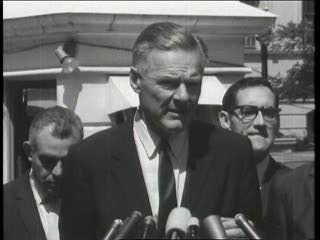 Lodge told newsmen he thought the situation had improved over what it was a year ago, both in terms of ground gained from the Viet Cong and in propaganda. He says the policy of the US should be to help the South Vietnamese, and added that anything that hinders the military is bad, and he hoped that the religious situation would be improved when he arrived there. To stop the spread of communism in Southeast Asia, America replaced France in South Vietnam--supporting autocratic President Ngo Dinyh Diem until his own generals turned against him in a coup that brought political chaos to Saigon. Chicago: “Vietnam: A Television History; America's Mandarin (1954 - 1963); JFK Confers with Lodge,” 08/15/1963, WGBH Media Library & Archives, accessed April 23, 2019, http://openvault.wgbh.org/catalog/V_E0C48D87538546D7AB6E0C15C4D486EE. MLA: “Vietnam: A Television History; America's Mandarin (1954 - 1963); JFK Confers with Lodge.” 08/15/1963. WGBH Media Library & Archives. Web. April 23, 2019. <http://openvault.wgbh.org/catalog/V_E0C48D87538546D7AB6E0C15C4D486EE>.